The Trex Marble Fireplace has a style and sophistication that quickly transports you back to the Art Deco era of architecture. 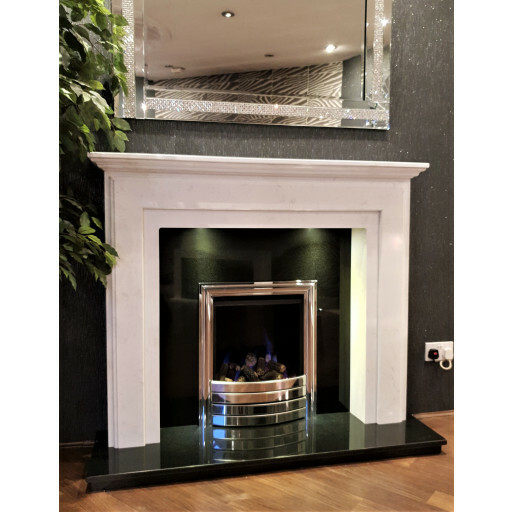 It has been designed featuring an Ariston white marble surround accented by a contrasting black granite back panel and hearth. Because only the highest quality marble and other materials are used in the construction of each Trex Marble Fireplace, this is a unit that is designed to look as beautiful and appealing decades down the road as it does the day it is installed. The striking black on white colour scheme is both traditional as well as timeless and makes the Trex Marble Fireplace a very handsome focal point whether placed in the dining room, the living room or any other space where people gather for relaxation and good conversation. If you want a fireplace featuring the most durable yet luxurious type of materials available in fireplace construction, then you want the style of marble used to fashion the stunning Trex Marble Fireplace. Not only is it functionally durable, it is also aesthetically appealing, adding a blend of both sophistication as well as warmth to any room. The Trex Marble Fireplace is surprisingly easy to maintain by simply dusting at least weekly with a dust cloth, and removing soot, or any liquid spills as soon as possible using a damp rag. Marble is resistant to both heat and water and retains its beauty year after year.